When you are teaching your kids letters and words when they are still discovering the world- you know how brilliant it feels! The word- “smith”- has always amused me! I remember having a blacksmith next to my mother’s house. All daylong he would bang on his pedestal and under his giant hammer the red hot iron would slowly take shape. Sadly the middle man who would buy these finished pieces would earn credits and our hammering neighbor would remain unknown. The title “Words of Smiths”- presented by Wizkonect- made me go back to all these. It made me think- about the ones who play with words- mixing and matching their sequences and coming up with new creations. Honestly the best of them are none other than the poets and writers. The present book “Words of Smiths”- presented by Wizkonect- contains 50+ poems. Capturing emotions- voicing concerns the poems are written by young and old – new and established poets from India and abroad. I would like to draw the reader’s attention to a few poems that have attracted me. Though I could have quoted many other- but these lines stayed with me. I am a casual poetry reader- and the easiest ones appeal the most to me. 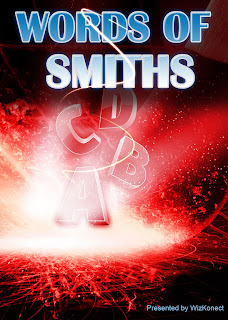 I find the effort on behalf of both All About Global and Wizkonect team appreciable- since many of the youngsters are trying to find a footing of their own and compilation like “Words of Smiths” are surely trendsetters. WizKonect introduces “Wordsmith” – a national level poetry contest. First in its own kind, “Wordsmith” works towards bringing Indian poems and poets into limelight. The book "word of smiths" comprises of the best entries of this contest. In the dictionary, the most beautiful word, asides from God and love, is poetry. Poetry is beauty and beauty is endless, therefore, poetry is endlessly beautiful. Magical integration of words which pass on great feelings to the readers. Poetry in India has been emerging and has recently produced some fine performers. Its new and yes, it brings a new light with it. The words that flow out of heart, put down on a piece of paper, brings to you the pensive mood of a pondering mind. India is a land blessed with culture, spirit, literature, knowledge and a lot more. Submitted by a 40 years old housewife based in Durgapur. True!! Beautiful poems in here.. I enjoyed reading them too.